The best climbing conditions of the summer are coming up on K2 according to the website Mountain Forecast.The key to the weather is that there is forecast to be light winds from the 2nd August to at least 5th August. With such a good forecast the expeditions will be hoping to at least to get to camp 4 at about 8000m. No one has been that high this year. The North Ridge Expedition will likely go back down and rest and make an assault on the summit at a later date. However, on the Pakistan side of the mountain it may depend on what progress they make. Kinga Brabowska has updated her website and is hopeful of making it to the top of K2, but wants more help from the expeditions that have recently joined. She explained that the conditions had been tough. There is alot of snow on the upper parts of K2. This has made the climbing exhausting and slow. Baranowska has been climbing with Fabrizio Zangrilli. Joining them was a Frenchmen( Bruno Buchet) and an Austrian( possibly Christian Stangl). They have laid ropes up to about 7000m and this is wher they setup camp 3. They have spent a night there. Ahead there is alot of work. She’s hoping the new arrivals help with setting up the rope to camp4 on the shoulder. Despite the severe conditions this she believes that they will succeed. The North Ridge Expedition to K2 have moved from base camp to the advanced base camp.They have done this in anticipation of better weather ahead. Once they have decided the date they will start climbing K2 again then they will move to camp 1 which is located at the start of the north ridge. The screen shot below shows the camps looking from the Chinese side. Maxut has been using a GPS so that it is possible to track his movements. It shows him at advanced base camp. After a gruelling 8 hour hike, Alex Txikon has arrived at the base camp for K2. It snowed and was very cold getting there. He compared the base camp compared to 2004 when he tried to climb K2. Back then there were many climbers. This time maybe only 15 were there. Amongst them is his climbing partner Gerfried Goeschl. Txikon will be aiming to climb K2 and if he does so he will have climbed 3 8000m mountains in the Karakoram summer. The North Ridge Expedition will not start up K2 again till the weather improves. This means that they will not leave and head higher up the mountain till at least August 1st. There has been poor weather for the past several days which has meant they had to retreat to base camp. They have had weather forecasts telling them of better weather to come from early August. The aim will be to establish camp 3 and them make their way to about 8000m and establish camp 4. From Tuesday onwards it is expected to be the best climbing conditions of the summer so far for a number of days. The expedition consists of: Gerlinde Kaltenbrunner, Ralf Dujmovits, Tommy Heinrich, Darius Zaluski, Maxut Zumayev and Vassiliy Pivtsov. Kaltenbrunner, Zumayev and Pivtsov have all climbed 13 8000m mountains and need to climb K2 to complete all 14. In a bitter blog, Italian Giuseppe Pompili has attacked Gerfried Goeschl over the way that he handled the expedition to Gasherbrum 1 and even the permit for K2 this year. Gerfried Goeschl was the leader of an expedition that went to Gasherbrum 1. He also arranged the expedition to K2 that is now occurring. Pompili had been climbing Gasherbrum 1. He did not manage to make the top, but other members of Goeschl’s expedition, including Goeschl, made the top of this mountain. Unfortunately for Pompili he chose the wrong day to make a summit assault of this mountain. He went the day after Goeschl and the others. The conditions that day were poor in contrast to the perfect weather Goeschl had to make the summit. He left base camp realizing the weather in the following 2 weeks would not give another chance. That Goeschl was an expedition leader who sat back rather than went out and get personally involved. He was interested in making as much money as possible from the participants of his expedition. He only thought of himself all the time and not others. Criticized all of the climbers who did not acknowledge the efforts of Louis Rousseau who laid the ropes the day before all of the other members of the expedition made the summit. In the end the effort cost him the chance to make the summit through exhaustion. What Pompili is saying is that Goeschl would have known that this would have exhausted Rousseau. Criticizes Goeschl for banning Rousseau from helping in the rescue of Marc André Beliveau 3 days later. This climber had cerebral edema on Gasherbrum 2. Pompili says that none of the Italians that were part of the expedition made the summit of Gasherbrum 1. He blames Goeschl for penalizing him and Adriano Dal Cin for not extending his expedition to K2. The CEO of Adventure Pakistan has borne the costs of that. He blames Alberto Magliano for inhumane treatment of a porter. He abused this porter with words. Karl Gabl of the Central Institute for Meteorology and Geodynamics is the meteorologist Gerlinde Kaltenbrunner turns to when she wants to know what the weather is like on K2. He has been talking to her on the phone recently and he thinks the chances are good Kaltenbrunner will make the summit of K2. Gabl said that he is happy with the progress that Gerlinde Kaltenbrunner and the other climbers with her have made so far by making it to camp 3 on the north ridge. He believes that they are on the right track for making the summit of the second highest mountain in the world. He has been on the phone with Kaltenbrunner and she said that the whole team is doing well and in good spirits. The north side of K2 where Kaltenbrunner is climbing, he said, was sheltered from the wind. But it was steeper. In recent days there have been winds of 90km/h on the summit of K2. From Tuesday onwards, he said, that there would be calmer weather. He expects them to establish camp 3 and then camp 4. After this they will go down to rest. He looked ahead and said that they might go for a summit attempt, with all the camps setup, in the middle of August. Gerlinde Kaltenbrunner only needs to climb K2 to be the first woman to have climbed all 14 8000m mountains without oxygen. This is her fourth year going to K2. After spending many frustrating days at Gasherbrum 2 base camp, Alex Txikon has finally started moving his gear over to the base camp of K2. The porters have arrived and he was none too pleased about the wait. He would not have missed any climbing on K2 though. In recent days there has been poor weather forecasts. He plans on going up the Cesen route. His climbing partner Gerfried Goeschl has already made it to 6850m and laid ropes on some of the route. The most important period of climbing on K2 will likely occur within the next few weeks. Now that August is just around the corner, all expeditions will have high expectations that they can reach the summit of K2. So far expeditions have been battling the weather and the finding the routes difficult. But their hard work may pay off come August provided the weather allows them. Up to this point there have been no serious attempt on the summit. All that there has been is slowly grinding their way higher and setting up camps. They will be hoping conditions suit them in August at some point. The North Ridge Expedition have made it to where they will place camp 3. This is at about 7250m( according to Gerlinde Kaltenbrunner). The camp has not been established though. Nor has anyone stayed at this height. 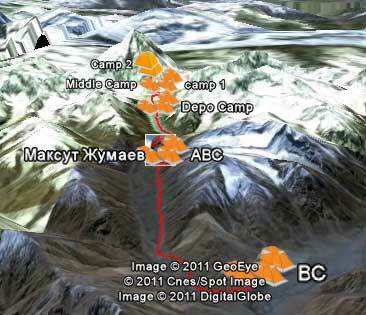 However, they have laid rope and have a camp 2 at 6600m. Their plans are to establish camp 3 and camp 4 on the next time they are climbing the mountain. And then make an assault on the summit when conditions allow. The expedition consists of: Gerlinde Kaltenbrunner, Ralf Dujmovits, Tommy Heinrich, Darius Zaluski, Maxut Zumayev and Vassiliy Pivtsov. They reached at least 6850m on the Cesen route. The last time they went up K2 it was with Gerfried Goeschl and Bruno Buchet. Like others on this route they have found the snow to be deep and the going slow. With little publicity these 2 were climbing together on the Abruzzi Ridge. They gave up after finding the route too difficult this year. Since then Buchet has said that he switched to the Cesen route. He made it to about 7000m and setup a tent. He said that he climbed with Kinga Baranowska, Fabrizio Zangrilli and Gerfried Goeschl. Stangl may be amongst them also on the latest climb. Goeschl arrived the earliest of the four climbers. He went as high as 6850m. Alex Txikon and Kilian Volken were expected to have joined him on the 27th July. Txikon though has been waiting at Gasherbrum 2 base camp for the porters to arrive so that his gear goes to K2 base camp. He has already climbed Gasherbrum 1 and 2. Adding K2 to this would be an amazing effort. Kilian Volken has just made the summit of Gasherbrum 2 also. Nasir will also be joining them to make it 4 climbers in the expedition. Kilian had wanted initially to climb with Nasir on the Abruzzi Ridge. Both Goeschl and Txikon are committed to the Cesen route. They will reconsider this when they arrive at K2 base camp. After the death of a climber, Jeff, on Broad Peak, it was uncertain if they would continue onto K2. However, Rob Springer has arrived at K2 base camp. Already ropes and camps have been setup by the support climbers for the company. They will be climbing on the Cesen route. Sophie Denis had planned on climbing K2 also. She just recently made the summit of Broad Peak. There is nothing yet on her website to indicate if she still is. There are only 2 routes currently being used on K2. These are the North Ridge and the Cesen route. The Abruzzi Ridge was found to be too dangerous. Rockfall has been significant. But Kilian Volken and Nasir will consider climbing this route when they arrive at K2 base camp. This will be the most important factor for the climbers. They will be relying on their own specialized forecasts to know when best to start up K2. What they will be looking to is a period of several or more days where there is a so called weather window. They will want the winds to be relatively calm on summit day and visibility to be good. Mountain Forecast says that on the 30th July till Monday afternoon there is not expected to be snow. Winds are expected to be moderate. However, on Monday night there is expected to be snow and on Tuesday too. The winds will decrease on Tuesday. The Taiwanese expedition on Broad Peak mentioned that there could be a weather window from the 3rd August till the 6th for that mountain. You are currently browsing the K2 Blog blog archives for July, 2011.